Beware – the dinosaurs are coming! Guaranteed to excite children's curiosity and capture their imagination, each stone shows a dinosaur footprint on one side and its owner on the other. 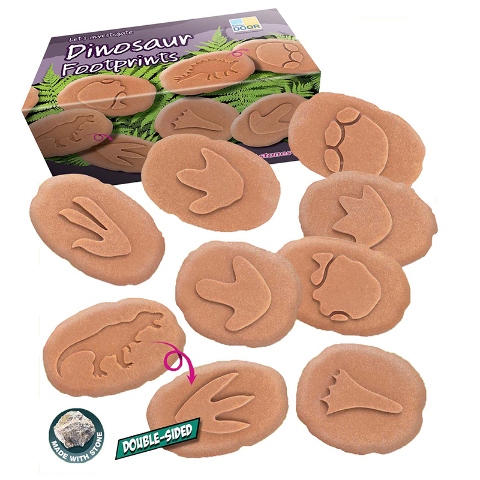 Perfect to encourage early investigation skills as children examine, compare and sort the eight footprints – Apatosaurus, Deinonychus, Hypsilophodon, Iguanodon, Quetzalcoatlus, Stegosaurus, Triceratops and Tyrannosaurus Rex. Children will enjoy making crayon rubbings, impressions in play dough, footprint trails and comparing the different shapes of the footprints. Made from our unique stone mix they are durable for use both inside and outdoors. Contains: 8 double-sided stones (3.5" x 2.5" inches). Age 3+.